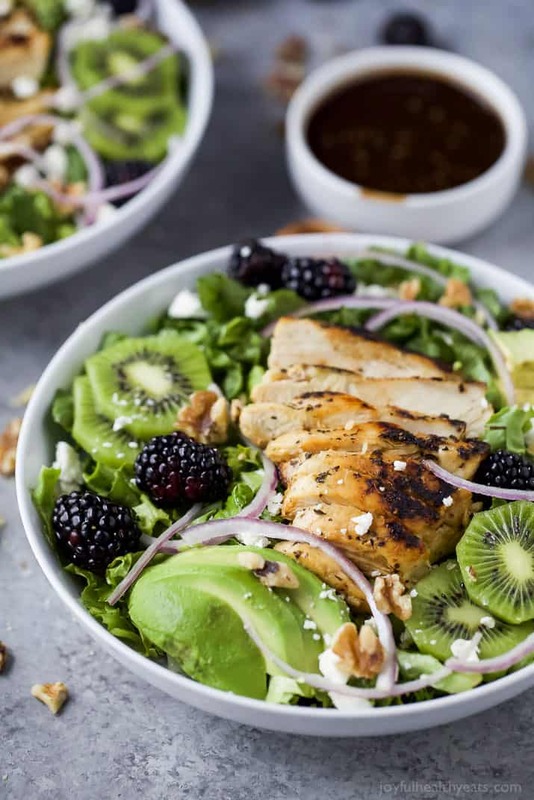 This Blackberry Kiwi Balsamic Chicken Salad recipe is an easy, light & naturally gluten free salad that’s perfect for Spring! 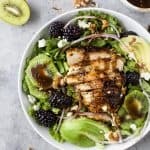 Blackberry Kiwi Balsamic Chicken Salad – an easy light naturally gluten free salad recipe filled with fresh fruit, feta cheese and tender chicken. 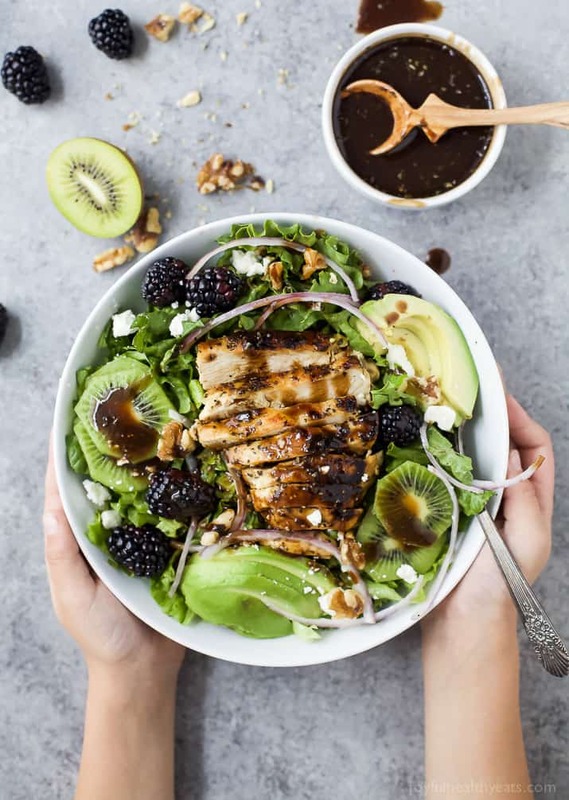 This quick 30 minute Balsamic Chicken Salad is perfect for the warmer weather! Watching two young kiddos by yourself is not for the faint of heart. As I sit here writing this, Mike is in Florida and I am at home with a 7 week old and an almost 6 year old who is on spring break. Which means instead of just taking care of one kid during the day, I need to take care of two and especially entertain one. I know lots of moms do it everyday and their kids are closer in age than my two. But it was my first “go” at doing it by myself, day and night. Wow am I exhausted. The nights are always the hardest, because I have to make dinner, get Cason ready for bed and it tends to be the time when Maddie is the most “wiggly” or fussy. Thank goodness for the swing. She was able to sit in it 1 out of the 3 nights Mike was gone. Let’s just say that when Mike gets back, Momma needs a massage, pedicure and some retail therapy. To be honest, I haven’t really left the house by myself (meaning without a child) yet. I’ve ran to the grocery store once and to the doctor for my 6 week checkup. But that’s it, and I really don’t count those because it’s not leaving the house “for me”. I have been dying to go to Lululemon or Target just to shop and spend money! Well, that and I desperately need new clothes. All my “workout” clothes are stretched out from wearing them during pregnancy. On a side note, I just got a Peloton bike! Do you know what they are? They were advertised big time during the holidays. It’s a stationary bike, basically a cycling bike that you’d ride in a cycling studio. The bike has a large monitor on the front, it has tons of on-demand cycling classes available on it already. But for a monthly fee you also get access to live cycling classes from NYC. It’s amazing! And honestly the perfect fit for what I need. Before I had Maddie I was cycling 4-5 times a week and even 3-4 times while I was pregnant all the way up to 38 weeks. I love it! But the cycling bar I went to didn’t offer childcare and for me it’s not practical to spend money to attend the class and to find a babysitter. Mucho Dinero. So, all in all the Peloton was the best choice and so far I love it! Do you have an at home workout system? Ok, moving on to the real reason you’re here. 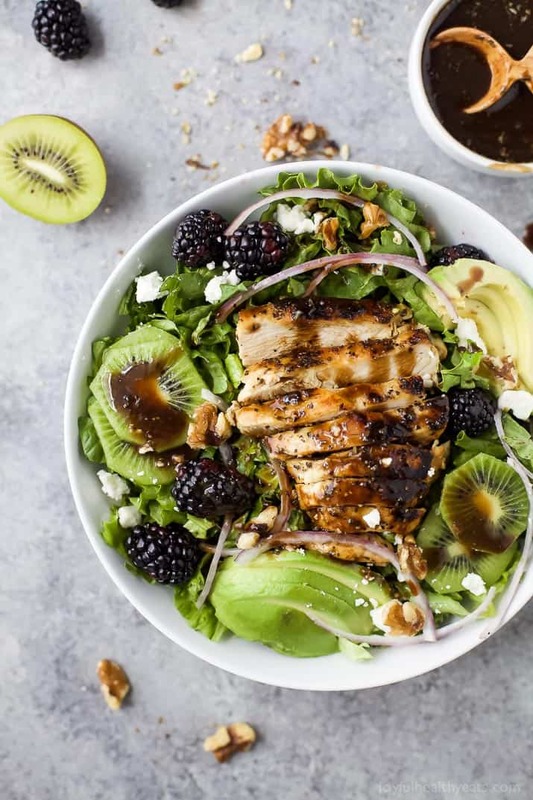 This gorgeous light Blackberry Kiwi Balsamic Chicken Salad – it’s a mouthful to say and a mouthful to eat. But I guarantee you’ll love all the flavors. 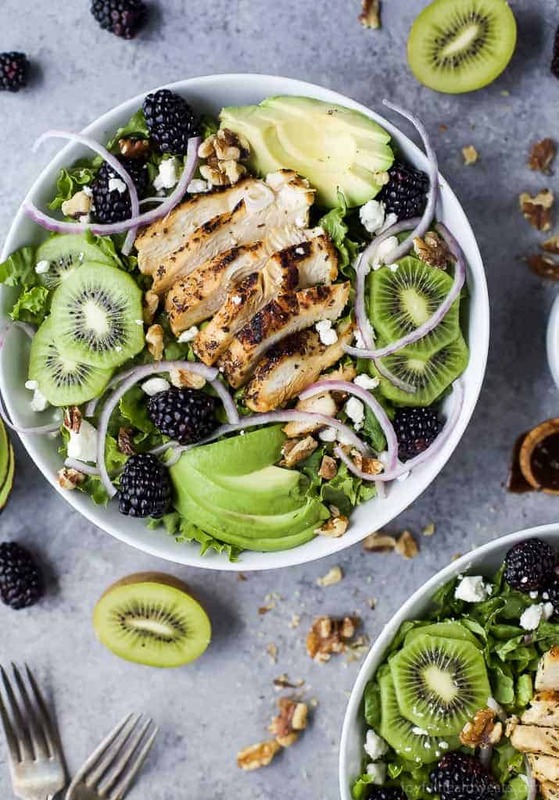 It’s the perfect healthy salad for the spring – filled with color, fresh fruit and flavor. I was really wanting to use fresh seasonal produce this month and you know what’s in season? Kiwi! Well, that worked out perfectly for me because my family LOVES kiwi. Cason was thinking of all kinds of recipes I could make with kiwi. In fact the agua fresca was kinda his idea. 🙂 Kinda. (wink wink) This one, meaning the salad, was mommy’s idea and man is it a winner! 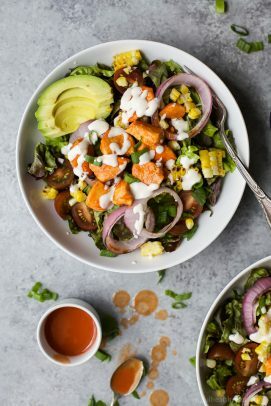 It’s sweet, tart, crunchy, creamy, salty … basically hits every note you want to hit in a salad. I just know that you’re going to love it! To a small bowl, add garlic powder, dry basil leaves, black pepper and salt. 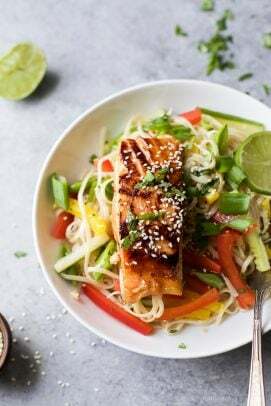 Mix together and season both sides of the chicken breast with the spice blend. Heat large skillet to medium high heat. 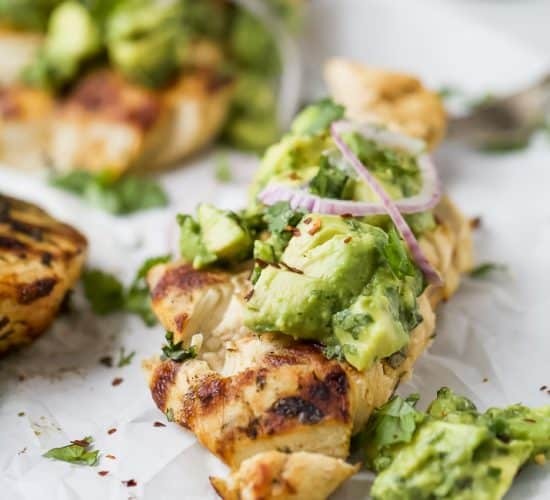 Add avocado oil to the pan and then add seasoned chicken breasts. Saute each side for 4-6 minutes. Until both sides have a nice sear on them and they are no longer pink when cut into them. Remove from pan and let rest for 3 minutes. Slice the chicken and set aside. 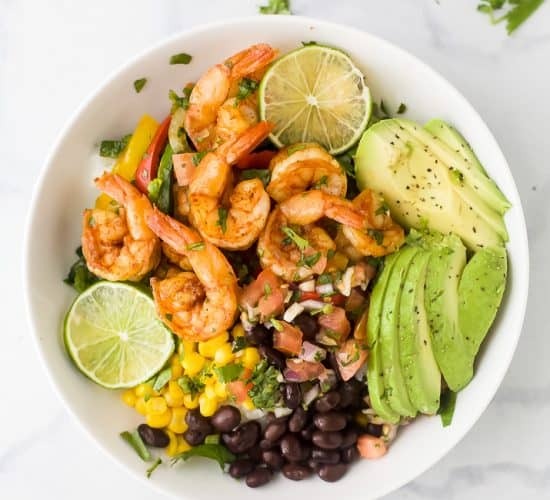 To a medium bowl, add balsamic vinegar, olive oil, dijon mustard, honey, dry basil leaves, garlic powder, salt and pepper to taste. Whisk together until the vinegar and honey no longer separate and dressing becomes thick. 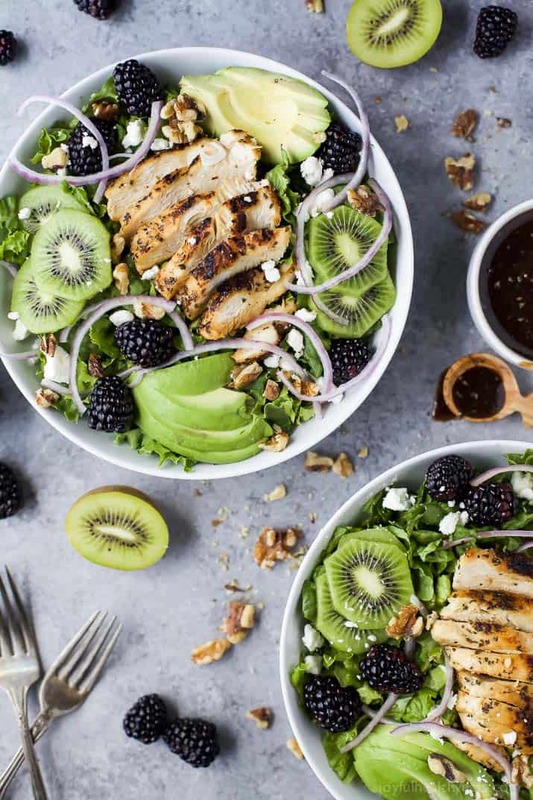 Assemble the salad: to a large bowl add spinach, blackberries, kiwi, red onion, avocado, feta cheese, walnuts and sliced chicken. 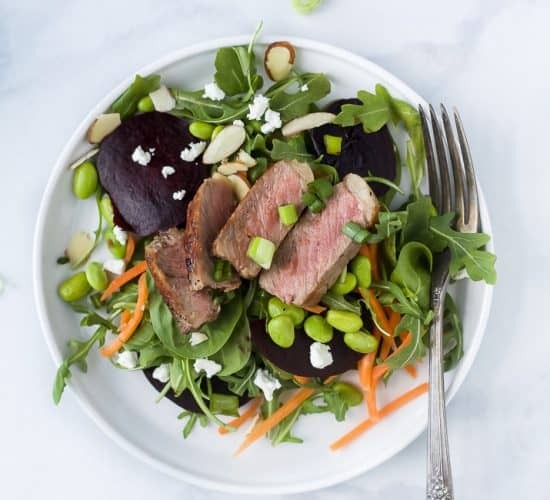 Serve with balsamic dressing on the side. 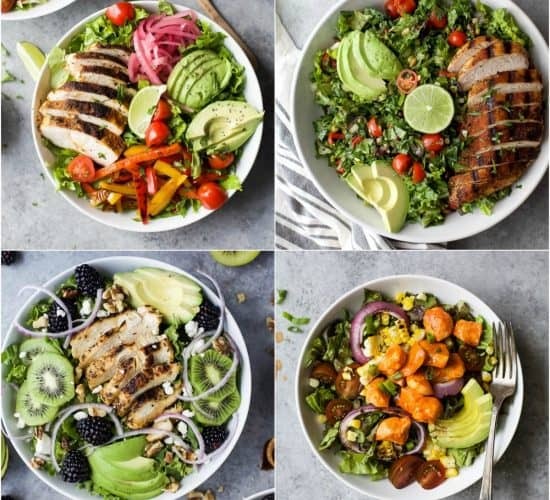 Want more Healthy Light Salad Recipes? Your idea is bursting with spring colours ! Love it ! Thank you ! Such an ahhmaaazing salad!! I LOVE all the wonderful flavors!! I will definitely be making this real soon!! I applaud your motivation to work out at home. Good for you! Looks like a great lunch option! 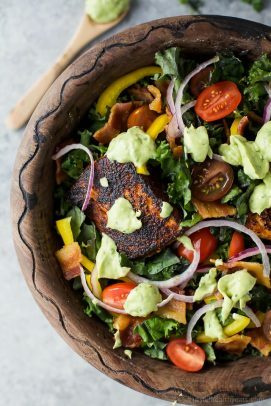 That is a seriously gorgeous salad. 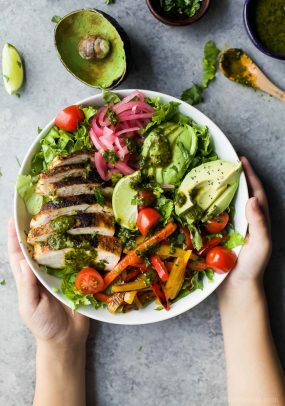 This salad is calling my name — looks perfect to me! Could you make me want a salad more! 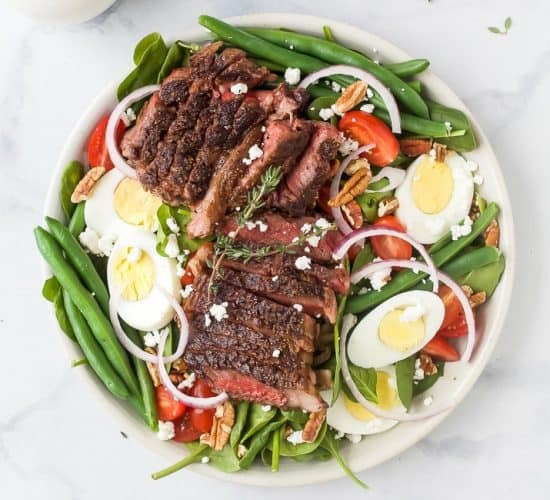 This is the best looking salad ever!